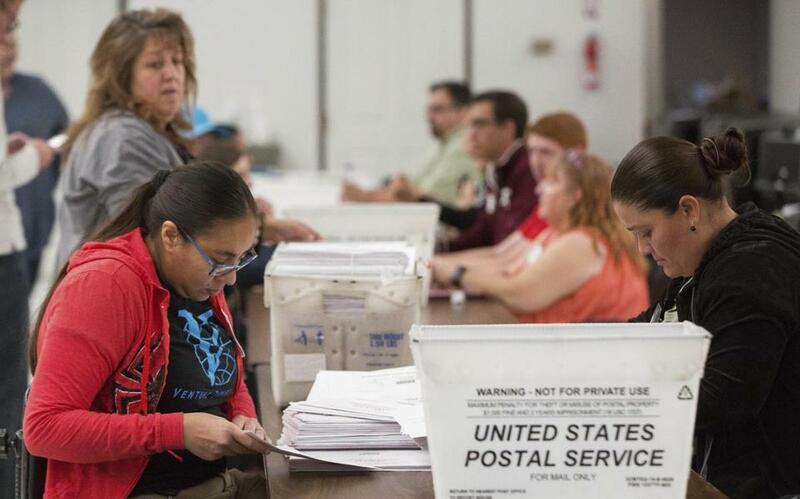 Poll workers counted absentee ballots at the Dona Ana County Bureau of elections warehouse Wednesday in Las Cruces, N.M.
WASHINGTON — The pragmatic Democrats won elections Tuesday night. And the showy liberal stars faded. The national darlings such as Andrew Gillum and Beto O’Rourke lost in Florida and Texas. Laura Kelly, a moderate state legislator with scant star power, took the governor’s mansion in Kansas. It’s a lesson for the Democratic Party as it tries to sort out a vast 2020 field: The people most liked by the party’s core liberals aren’t consistently winning in general election matchups. Some of the ones who focus on the middle or are simply less exciting emerged victorious. Or, from a Massachusetts perspective, it was a bad night for firebrand Elizabeth Warren-type candidates and a good one for the more practical-sounding Deval Patricks of the world who might run. Democratic strategists, still poring through election data Wednesday, found that their party made modest gains in areas where Donald Trump won two years ago, while the president wasn’t able to expand his base of supporters — which they see as a good sign for any Democratic nominee in 2020. And there was some evidence that the night went to the less flashy candidates, with Democratic gubernatorial candidates performing particularly well in states Trump won. Those who stayed away from a national slugfest with Trump tended to win. That’s not a great sign for Warren, who relishes tangling on Twitter with the president. Or for Cory Booker, the New Jersey senator with a flair for the dramatic. But it might work for lower profile candidates outside of Washington. “Anybody in D.C. is going to have to prove they understand how broken things are, and they have a credible way of fixing it,” said Doug Rubin, a Democratic strategist who was chief of staff to Patrick when he was governor of Massachusetts. He pointed to the fact that Democratic gubernatorial candidates without a national profile won in Wisconsin, Michigan, and Pennsylvania — three states that delivered the White House to Trump. Even if Warren’s style of being a feisty Trump fighter and national phenom wasn’t rewarded in the midterms, progressives argue that the results do show a potency to her economic populist message. Sherrod Brown of Ohio — another potential 2020 candidate — and Wisconsin’s Tammy Baldwin won in Trump states by pushing such a populist message, said Adam Green, the cofounder of the Progressive Change Campaign Committee. On the flip side, Democratic senators who downplayed the liberal economic agenda in order to position themselves as moderate Democrats, including Heidi Heitkamp of North Dakota and Joe Donnelly of Indiana, lost, he said. He pointed to data compiled by his committee’s sister organization, the Progressive Change Institute, that show 65 percent of the incoming class of Democratic House freshmen embraced providing some version of Medicare for all or expanding Social Security benefits — ideas backed by the liberal wing. “That shows the Democratic Party has vastly shifted in an Elizabeth Warren-style direction and that’s the way Democrats are viable in 2018 and in 2020,” Green said, while acknowledging that the high wattage progressive personalities didn’t prevail. He noted that just five years ago, in 2013, then-President Obama was trying to cut Social Security benefits. Now nearly 90 percent of the incoming class of House Democrats support protecting Social Security. And 46 percent of them want the entitlement expanded. “That’s a sea change from where we all were a few years ago,” Green said. But Warren’s favorites in the campaign came up short, including in two races where she had close ties. Richard Cordray, the former head of the Warren-conceived Consumer Financial Protection Bureau, lost his gubernatorial bid in Ohio, a key swing state in the presidential election. Warren stumped on the ground for Cordray, fund-raised for him, and even seeded his campaign with a key member of her communications team. The matchup had some elements of a Trump v. Warren contest. Trump held rallies in Ohio for the winning candidate, Mike DeWine. During one campaign rally, Trump sought to tie Cordray directly to Warren calling him a “clone of Pocahontas,” using his favorite racial slur for the senator. Cordray had more votes than John Kasich took when he won the position in 2014 — and still lost, showing how jazzed the GOP base can get in that state. The other potentially tough news for Warren was Katie Porter’s race in Orange County, in a California House district that Hillary Clinton won in the presidential contest. Porter is significantly trailing GOP incumbent Mimi Walters, though ballots remain to be counted. The liberal platform became a liability in the general election, when Walters accused Porter of wanting to raise taxes to fund a “government takeover” of health care. Tuesday was also a big night for female candidates of color. New Mexico elected the country’s first Democratic Latina governor, and Texas its first Latina congresswoman. Native American and Muslim women won their bids to become members of Congress for the first time in history. And Boston City Councilor Ayanna Pressley will become Massachusetts’ first black woman in Congress. That could bode well for Kamala Harris, the California senator. And the larger trend in favor of women could help Warren, too. But the voters of the women’s march still care most about winning. “They like backing up the women candidates, but they’re looking for the best candidate,” she said. Longtime Democratic strategists noted that the 2020 election is a long way off. “I don’t think there’s anything in the results last night, particularly with the huge field we’re going to have, that I would rule somebody in or out based on what happened,” said Joe Trippi, a Democratic operative who helped Senator Doug Jones win a special election earlier this year in Alabama. The bigger trend, he said, is there’s momentum moving toward Democrats nationally in the Sun Belt and Midwest, where they overperformed compared to 2016, except for the Ohio governor’s race. And the Democratic debate over its leadership may not break down on the predictable establishment vs. progressive ideological line as it did last cycle, Trippi predicted. In two years, voters could still be attracted to female candidates, as they were on Tuesday, or they could be seeking a generational change, with a younger Democrat appealing. Or they could want a stable, older statesman figure like Joe Biden to take the reins after a chaotic time in the White House. Correction: An earlier version of this story incorrectly described the election of the country’s first Democratic Latina governor.